1) Worktable. 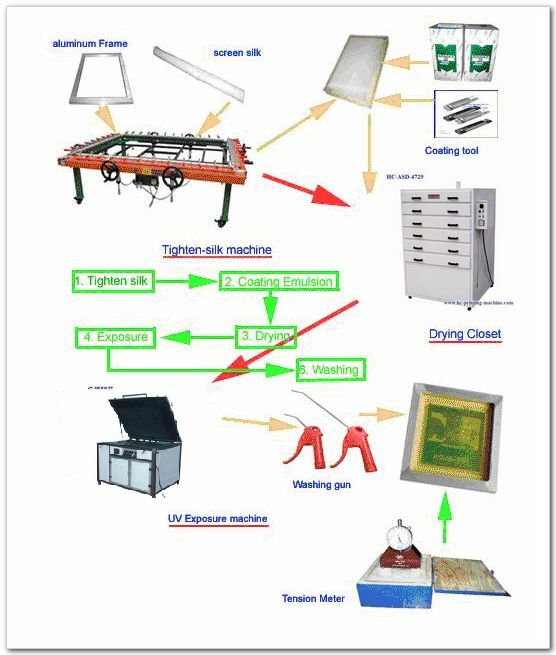 To put fixture and article, different type of screen printer with different worktable, there are mainly 4 styles worktable: flat worktable, T type worktable, vacuum worktable and cylinder worktable. The size of worktable can be customized according to the article. 2) Screen printing system. Install squeegee to scrape ink. 3) Screen plate system. To put screen plate and ink. 4) Control panel. There are 2 kinds of printing model, one time printing for sample test and automatic printing for mass production. 2) According to print color： single color screen printer，2 colors s printer, 4 colors screen printer, 6 colors screen printer, 8 colors screen printer and 10 colors screen printer. 4) According to the print colour：flat screen printer and cylinder screen printer. 1) Screen plate. Take net yarn tension, mesh count, screen frame size into consideration to make it according the material of article. 3) Screen printing ink. There are solvent ink, UV ink and varnish. You should choose ink according by the material of article to test. 4) Fixture. Make jig by the shape and size of article. General request is that the top of cross section of jig parallel to the screen plate. D) How to choose squeegee? 1) Mixed type squeegee suit high speed screen printing, because the side touch the product in front of squeegee can cure. 2) Round type squeegee use for plane article, like paper, garment, etc, especially good for thick and thin lines printing and dot matrix printing. 3) Triangle sharp type squeegee can print on glass and plastic bottles, also with textile fine printing. 4) Groove squeegee for container such irregular product printing. 6) By the hardness of product: 55―65 degree is soft style, for medium press regular and irregular article, 65―75 degree is medium style, for all kinds of printing, 75―95 degree is hard style, for fine screen printing. （1）Well viscosity to the print surface. （4）ink gloss without change by the article surface. （5）Dry fast, and not effect ink viscosity. 1) Ink printed on article is thicker if the angle of squeegee is smaller, and the opposite also works. 2) Ink is thinner if the viscosity of ink is bigger and thicker, and the opposite also works. 3)Ink is thicker if the substrates of article are coarser. 4) Ink is thinner if print speed is higher, it works the opposite side. 5) Ink gets thicker if the print environment with higher temperature. Fixture is specially made by the shape and size of product, clip product on worktable steady, now days it’s very popular to make jig by putty and hardner. Cylinder screen printer should make one set of fixture including gear.